Glasgay 2008 is well at home in the lofty peak of Garnethill. Most famous for Glasgow School of Art and Glasgow Film Theatre , both are connected with this year's festival. In and around this area of Glasgow, there are super places just waiting to be found. Ive written about the best right here. every Christmas, GFT shows the ever so slightly crimbo-camp of It's A Wonderful Life to packed audiences who cheer and clap at the end. In line with the Tennessee Williams retrospective this year, several movies based on his plays will be shown. There's lots more to look forward to, however. Look out for the Australian short movie 'Prada Handbag', and the heart-warming Canadian drama 'Breakfast With Scot'. 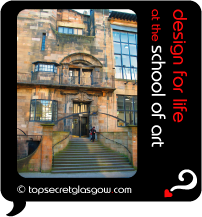 Glasgow School of Art covets one of the most famous buildings in Scotland. It was designed and build by Glaswegian style guru Charles Rennie Mackintosh. If you have time, take one of the guided tours. These are often put on by existing students, and are enthralling. Its great to see behind the scenes, and to realise that 100 years on, it really is a working building. Dont forget your camera. Utter Gutter club will be alive and kicking again at Glasgay 2008. Nights of disco heaven await! For wonderful food, served pre-theatre or post-event, youre spoiled for choice around here. The best food is served by Red Onion, Gamba and Baby Grand Charing Cross. Psst!... Are you long familiar with the Glasgow gay scene? Then youll remember the site now taken up by Gamba as the Squires bar of old, and may even shed a tear for its passing? In my humble view, there are several watering holes well worth a visit near Sauchiehall Street . And even many luvvies  thats actors and crew - from the nearby Kings Theatre. Other local bars worth a look are the cool cocktail vibe of the Blue Dog with stays open until the wee small hours every night. And the well-tucked-away top secret charms of The Universal  another little local bar tucked away in a city centre alley, and well worth the effort in finding. 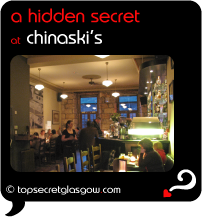 A short stagger further away from GFT and CCA, one of the coolest places for food and drink is Chinaski's , just over the M8 and in the shadow of the Mitchell Library. Its decked garden has plenty of heaters to allow you to stay outside in the autumn weeks of the festival. Time for more? 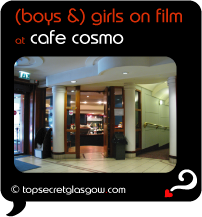 Next stop on these five Top Secret Missions to make the most of Glasgay 2008 is Glasgow's West End. Time to grab your very own page all about Glasgay 2008! festival. So, if you are as big a fan as me, why not tell the world why this makes you want to run open-armed and panting into its open arms. Do you have a special story about Glasgay! Festival? A funny experience? A grand occasion? A funky photo? A personal tip? A top secret?